Dante Gabriel Rossetti, ‘Prosperpine’ (detail), 1871. Pastel on paper, 97 x 46 cm. Source: Ashmolean Museum, Twitter. The Ashmolean Museum at Oxford holds one of the best collections of Pre-Raphaelite art in the country. Gems by John Everett Millais, William Holman Hunt, Edward Burne-Jones, Arthur Hughes, Ford Madox Brown and Frederick Sandys, among others, occupy the walls of the upstairs gallery (see rather poor-quality iPhone photo below), as well as sculptures by Alexander Munro and the impressive Prioress’s Tale Wardrobe painted by Burne-Jones. A frequent haunt of my undergraduate years at Oxford Brookes, this week I returned to the museum to see drawings and watercolours by Rossetti in the Western Art Print Room (strangely enough, though I didn’t realise it at the time, on the artist’s birthday) and also the brilliant current exhibition Great British Drawings. The Pre-Raphaelite galleries at the Ashmolean Museum. 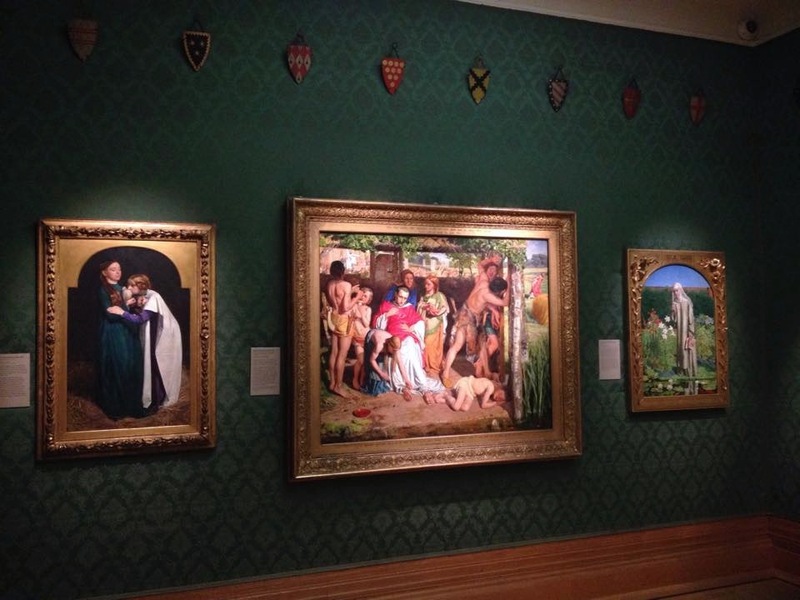 From left to right: Millais, ‘The Return of the Dove to the Ark’; Hunt, ‘A Converted British Family sheltering a Christian Missionary from the Persecution of the Druids’; Charles Allston Collins, ‘Convent Thoughts’. The exhibition showcases some of the Ashmolean’s finest drawings and watercolours by British artists from the seventeenth century to the present day. It’s divided into five sections: Likeness, Sensibility & Vision: 1650-1830; Travel & Topography; Ruskin & the Pre-Raphaelites; Diversity & Conflict; Caricature and Satire. For the purposes of this blog I will highlight a few of the works in the third section which appealed to me most. Arthur Hughes, ‘The Knight of the Sun’, 1860-61. Watercolour and bodycolour on paper, 22.3 x 31.6 cm. Source: Ashmolean Museum. Arthur Hughes painted The Knight of the Sun as a watercolour replica of an oil painting of the same name, which had been exhibited at the Royal Academy in 1860. 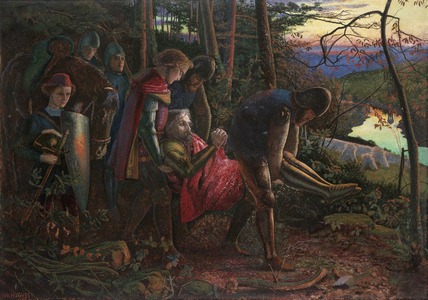 According to Frederic George Stephens the picture ‘illustrates a legend, an incident of which declared how an old knight, whose badge was a sun, and who had led a Christian life throughout his career, was borne out of his castle to see, for the last time, the setting of the luminary he loved.’ To some degree, then, the picture is underpinned with a narrative, albeit an obscure one (the exact source of this legend is never described); but the concern here is much more with mood and atmosphere, with the gentle melancholy of sunset symbolising the passing of life. As with Millais’s Autumn Leaves (1855-56), Hughes heightens this sense of transience through an autumnal setting, as indicated by the spindly branches against the twilit sky in the top-right corner — these counterbalanced with the deep forest of evergreens from which the solemn medieval procession emerges. On a more technical note, his opaque, rich handling of his watercolours reflects the influence of Rossetti’s own paintings in that medium — more on that shortly. John Everett Millais, ‘The Death of the Old Year’, illustration for ‘The Moxon Tennyson’, 1855-57. Pen and ink on paper, 9.7 x 8.4 cm. Source: Ashmolean Museum. John Everett Millais, ‘Mariana’, illustration for ‘The Moxon Tennyson’, 1855-57. Pen and ink on paper, 9.6 x 7.9 cm. Source: Ashmolean Museum. 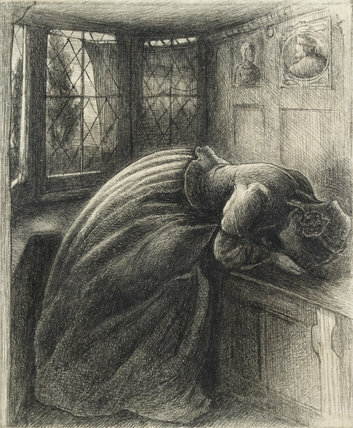 John Everett Millais, ‘St Agnes Eve’, illustration for ‘The Moxon Tennyson’, 1855-57. Pen and ink on paper, 9.7 x 7.2 cm. Source: Ashmolean Museum. 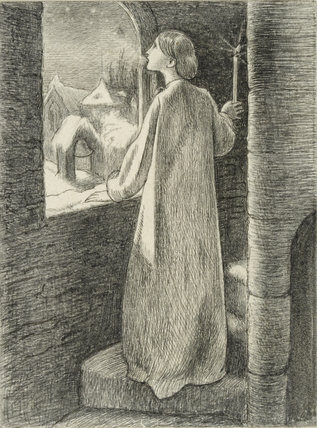 My favourite detail in the ‘St Agnes Eve’ drawing is the little breath of mist from the mouth of the poem’s narrator — exactly what could be expected from standing in a cold convent staircase in the middle of winter and wearing only a nightgown! There is a sense of optimism in the poem; in the final stanza a ‘new foot’ is heard and a ‘new face’ seen at the door, that of the New Year. 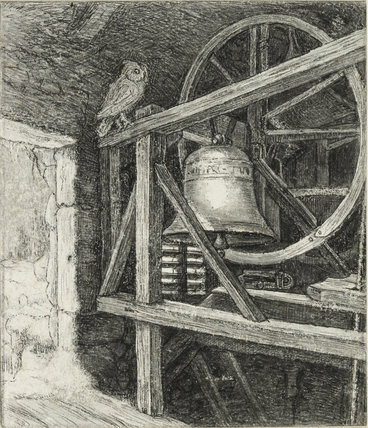 Millais’s drawing has the wintery landscape with snow piled at the belfry window, and an air of quiet stillness before the bell rings out in animated life — at which point the owl will presumably take wing and flee. As a side note, I liked the curatorial decision to frame the five drawings together under one mount. 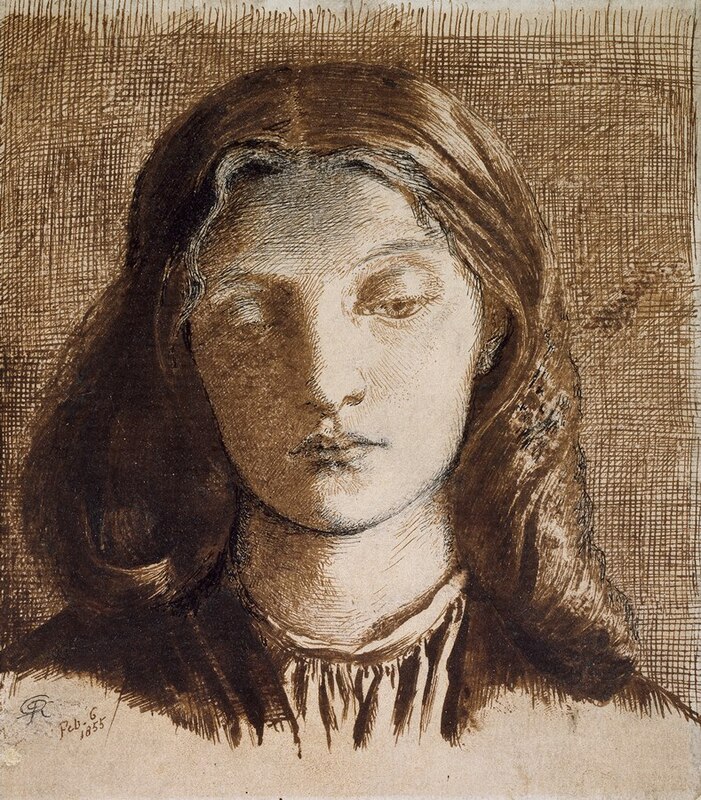 Dante Gabriel Rossetti, ‘Elizabeth Siddal’, 1855. Pen and brown and black ink on paper, with some scratching out, 13 x 11.2 cm. Source: Ashmolean Museum, Facebook. Of the many drawings Rossetti made of Elizabeth Siddall this is undoubtedly my favourite, and it was a treat to finally see it in person; its small size, smaller even than a postcard, surprised me. To scrutinise it under the lens of the Rossetti-Siddall romantic biography is almost to distract from its power as a solo, full-face, head-and-shoulders portrait of a woman — though undoubtedly Rossetti’s affection for her is manifested in the drawing’s sense of intimacy and its tender delineation of Siddall’s downcast eyes and pursed lips. The exhibition catalogue makes the interesting observation, easy to forget, that the portrait was probably drawn by gaslight, and also that Rossetti scratched away some of the ink to achieve the effects of light and shadow. Dante Gabriel Rossetti, ‘Ruth Herbert’, 1858. Graphite on paper framed as an oval, 50.8 x 43 cm (frame). Source: artfund.org. This beautiful drawing of the Victorian actress Louisa Ruth Herbert was acquired by the Ashmolean last year, along with a few other Rossettis (I was fortunate enough to be shown another portrait of Herbert, in watercolour, in the Print Room). 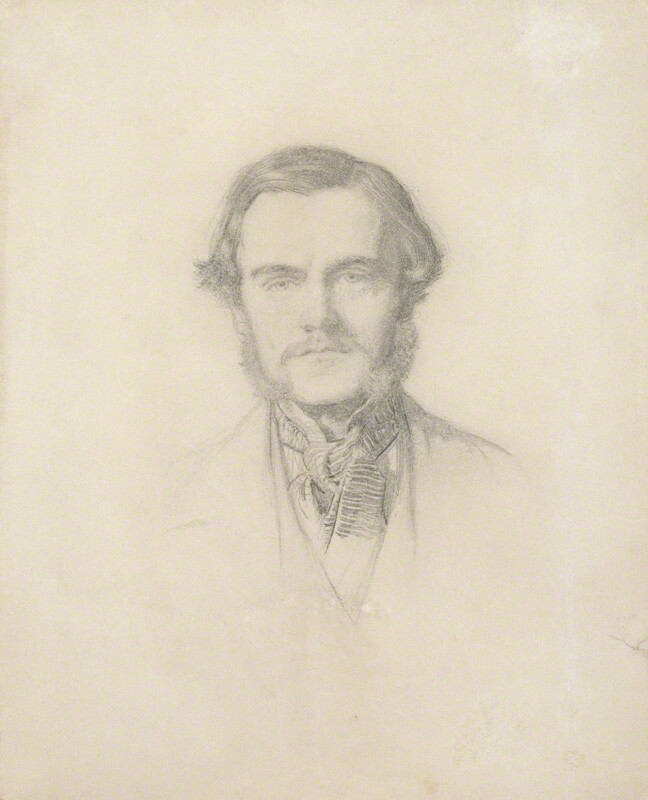 Rossetti first saw Herbert at the Olympic Theatre in London in February 1856, only a few months after her official stage debut — as with Siddall, Jane Morris and Fanny Cornforth he sketched Herbert in numerous poses and varying degrees of decorum. 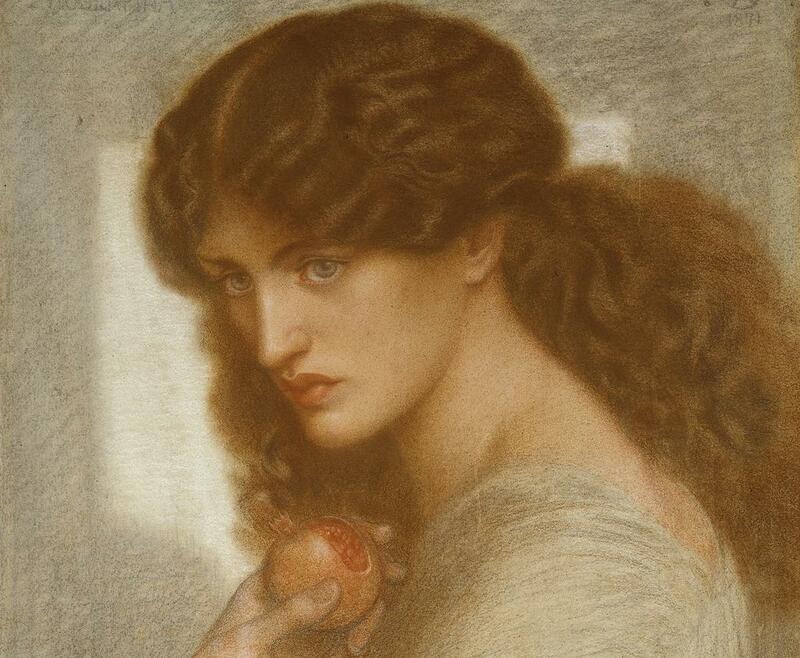 The above has all the qualities of a Rossetti ‘stunner’, with abundant wavy hair, a long-throated neck, full lips and heavy-lidded eyes, lending it a definite air of sensuality despite the neat collar of her dress beneath. The drawing itself is finely detailed (note the stray strands of hair) with an overall softness. Dante Gabriel Rossetti, ‘Dante drawing an Angel on the First Anniversary of Beatrice’s Death’, 1853. Watercolour and bodycolour on paper, 42 x 61 cm. Source: Ashmolean Museum, Facebook. I have Rossetti’s watercolours on the brain at the moment, so it was a joy to examine one of his largest and most sumptuously coloured pictures at my leisure. The subject is related to Dante Alighieri’s 13th-century autobiographic text La Vita Nuova, one of Rossetti’s favourite pictorial sources which he also translated from the Italian in the 1840s. His brother William Michael posed for the figure of Dante, who, as the title suggests, has been drawing an angel a year after the death of his beloved Beatrice Portinari. What really came home to me in standing before the picture is that it presents the act of the visionary painter: rather than sketching the Florentine cityscape visible through the window, Dante has turned his gaze inwards for a far more unearthly vision, though one perhaps suggested by the curious angel heads lining the cornice of his chamber. 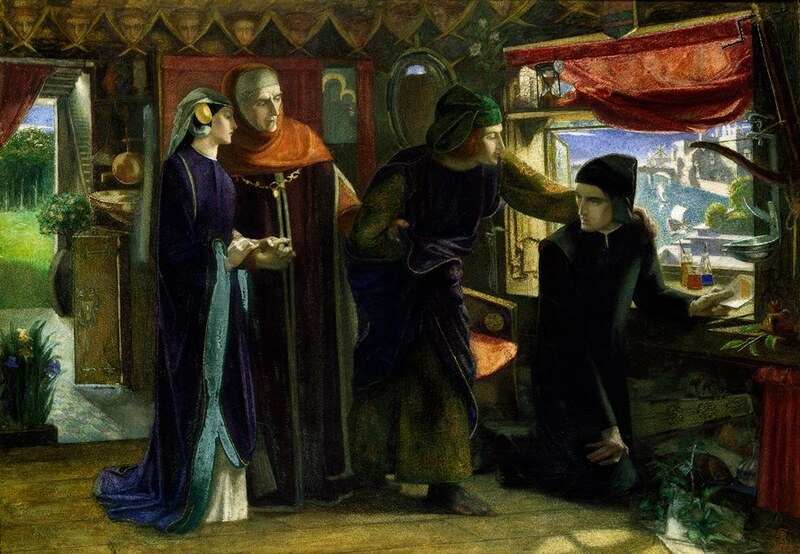 Like Rossetti, too, Dante becomes both poet and painter; the latter is evident from the flasks of colour on the windowsill. The exhibition catalogue succinctly describes the artist’s highly inventive watercolour technique: ‘Rossetti painstakingly applied the almost dry pigment, giving a deep saturation of colour quite unlike the effect of traditional watercolour washes, but akin to the appearance of medieval manuscript illumination.’ The traditional layering of broad transparent washes, usually associated with the landscapes of Turner and others, are represented elsewhere in the exhibition, and it is a rare opportunity to compare such equally radical but aesthetically and technically different watercolour techniques. Great British Drawings is on at the Ashmolean Museum, Oxford, until 31 August. Video about the Pre-Raphaelite paintings on display at the Ashmolean. Produced by Oxford Brookes University. The exhibition homepage on the Ashmolean website. Pre-Raphaelite Reflections is now on Facebook! A link to the page can be found on the menu in the top right-hand corner, or simply click here. Besides updates from this blog, I will also use it as a platform for any Pre-Raphaelite news which comes my way! — All the best, Rob. John Everett Millais, William Holman Hunt, 1853. Pencil, 23.5 x 18.9 cm. Source: National Portrait Gallery. Firstly, an apology for a lack of recent activity – that’s the life of a Masters student! 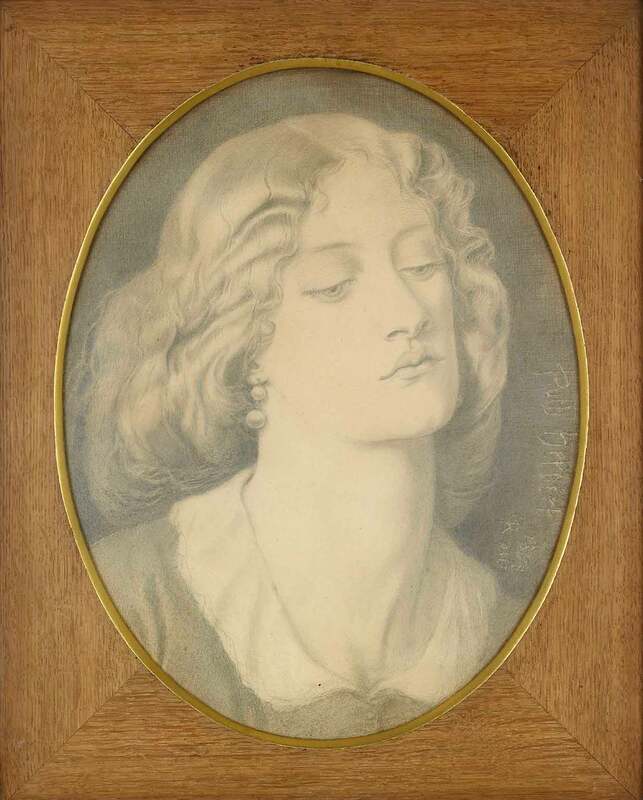 I’ve begun research on my dissertation, the subject of which is D. G. Rossetti’s watercolours from 1850-70; watch this space. In the meantime I thought I would share a curious anecdote discovered in that most famous and comprehensive of Pre-Raphaelite documents, William Holman Hunt’s Pre-Raphaelitism and the Pre-Raphaelite Brotherhood. First published in 1905, this two-volume work is a mine of information from one of the Brotherhood’s founding members and did much to establish a standard narrative of its formation, though its viewpoint is understandably quite biased towards Hunt himself. 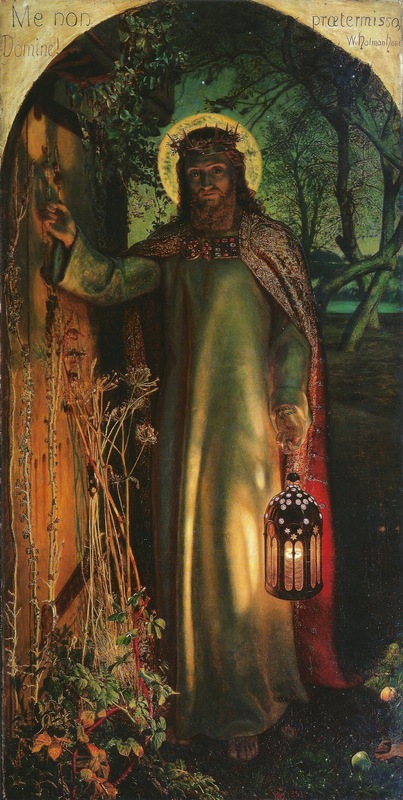 William Holman Hunt, The Light of the World, 1851-52. Oil on canvas, 122 x 60.5 cm. Keble College, Oxford. Scanned from Judith Bronkhurst, ‘William Holman Hunt: A Catalogue Raisonné’ (Yale University Press, 2006). When Hunt asks the stationmaster ‘What is it?’, the latter replies, ‘It’s a ghost. […] I have seen it more than enough.’ Hunt immediately wants to follow the shape, even asking for the man’s lantern ‘that I may pursue and examine it.’ He delays too long, however, and the white figure vanishes into the night; he arrives at his uncle’s house with the mystery unsolved. This occurrence in 1846, then, is told through the literary device of a flashback. It turns out to be just the village policeman on his nightly rounds. Nevertheless Hunt reveals his talents as a writer here – his evocative descriptions, built-up suspense and genuinely creepy imagery would not be out of place in a novel by Wilkie Collins (the famous opening of The Woman in White comes to mind) or Sheridan Le Fanu (Uncle Silas in particular). Furthermore, while a natural explanation for the second incident does reveal itself, the first, involving the strange white figure in the dark woods, is left ambiguous simply because Hunt himself could discover no reason behind it. Detail of The Light of the World. The above accounts did get me thinking about their relation to Hunt’s art. The Light of the World has always struck me as having an atmosphere somewhere between the natural and supernatural: on the one hand the many passages of minute detail, from the clustered brambles to each little aperture of the lantern, are true to what can be directly observed by both the artist and his subsequent audience (us); on the other hand the luminous greenish light of the background, indeterminable as either dawn or twilight, and the glowing disc which is simultaneously the moon and Christ’s halo, are all ethereal, unworldly elements. Gothic details can be found in the ivy and the brown bat hovering over the doorway. 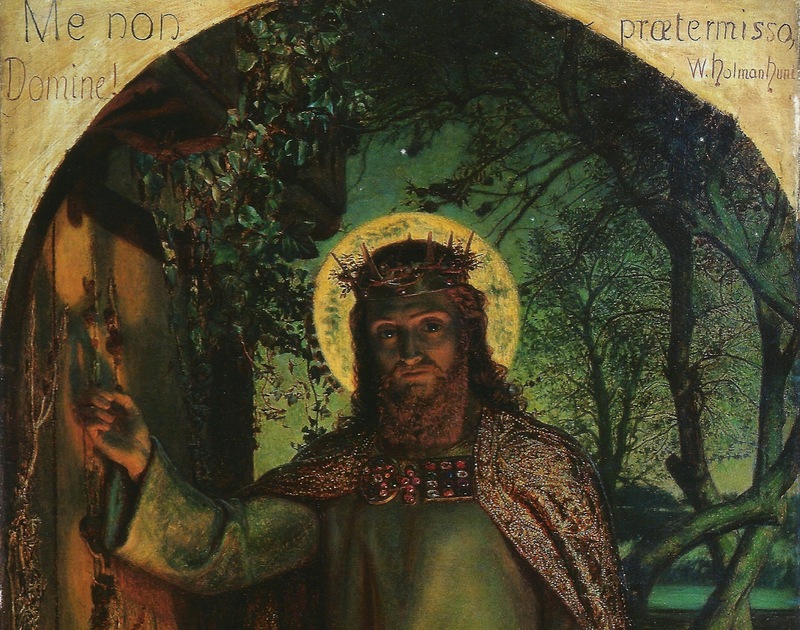 Christ is a supernatural presence in the context of this painting; Hunt presents the spiritual, allegorical message of Jesus knocking on the door of the soul, which can only be opened from the inside. He is a ghost of sorts, and His direct gaze establishes a supernatural encounter with each viewer. Of course, as numerous scholars have noted, The Light of the World is likely to have originated in a kind of religious epiphany Hunt experienced when reading a specific passage in the Book of Revelation: ‘Behold, I stand at the door, and knock: if any man hear my voice, and open the door, I will come in, &c.’ Indeed, the images I have supplied above show the spandrels of the canvas (usually concealed under the frame) in which Hunt inscribed ‘Me non praetermisso Domine!’ (‘Don’t pass me by, Lord’). Any feeling of uncanniness the painting holds is certainly enhanced by the nocturnal conditions in which Hunt painted it – not least being spooked by the village policeman rustling through the dead leaves at midnight! William Holman Hunt, The Haunted Manor, 1849. Oil on board, 23.3 x 33.7 cm. Source: Tate. As an addendum to this I thought I would include another painting by Hunt which has often intrigued me. Its title, The Haunted Manor, was apparently his own invention, and its size is actually very small. 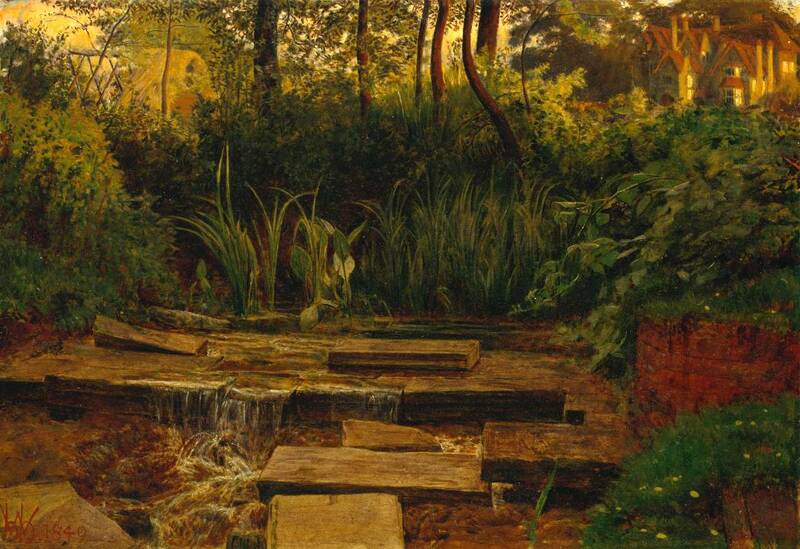 The majority of the foreground, with a babbling brook, was painted en plein air on a sketching trip with Millais to Wimbledon Park, south-west London, in 1849. But the background, comprising a hayrick on the left and an old manor on the right, was probably a later addition. According to Judith Bronkhurst the house is none in particular, but ‘may have been introduced in the hope that a certain narrative element would help the picture to sell at the forthcoming Liverpool Academy [of 1856].’ It is interesting, then, that the title specifies the manor as being haunted. The soft, green-gold lighting of the painting, evoking late afternoon at summer’s end, is somewhat deceiving, which is to say that its warm atmosphere does not immediately suggest a haunting – even changing the word ‘haunted’ to, say, ‘old’, ‘peaceful’ or ‘quiet’, alters the mood to something less (to use Lovecraft’s word) eldritch. Is it possible that some unknown presence resides in the distant house with the blazing windows? The literary work which immediately sprang to my mind when I first saw the painting was Henry James’s The Turn of the Screw, and its setting of Bly House, though these came much later in 1898. Hunt’s is a rather generic type of old English manor, with the expected tall chimneys and high gables, recalling the notion that any ancient house probably has something brooding within its walls. Both volumes of Hunt’s Pre-Raphaelitism and the Pre-Raphaelite Brotherhood can be read online on The Internet Archive. Episode 3 of the BBC’s informative documentary series The Pre-Raphaelites: Victorian Revolutionaries, has a few minutes on The Light of the World (clip starts at relevant point).